2010-11 Playoff Contenders Patches represents the evolution of Panini's most prestigious brand. For the first time in the product's storied history, Rookie Ticket Autographs feature pieces of memorabilia. At Least one autograph featuring a 2010 NBA Lottery Pick per box! 200 one-of-one Championship Ticket parallels! For the first time in Contenders history, Rookie Tickets Autographs will contain a piece of memorabilia! Each case break will deliver at least one of the following autographs: Kobe Bryant, John Wall, Shaq, Dual-Signed Building Blocks Black Auto numbered to 10 or less or Place In History Auto numbered to 10 or less! Classic Tickets Prime Material Autographs numbered to 10 or less! Rookie of the Year Contenders Autographs including an unprecedented two #1 picks - John Wall and Blake Griffin! Place in History Autographs featuring a handful of odd draft-day pairings as Bryant and the Charlotte Hornets, Dirk Nowitzki and the Milwaukee Bucks and Pau Gasol and the Atlanta Hawks! 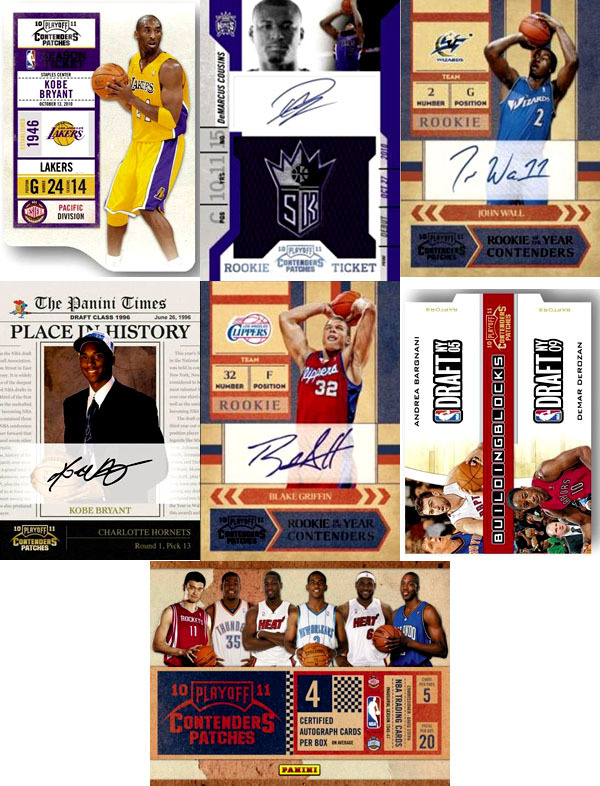 Blake Griffin, Amar'e Stoudemire, Derrick Rose, Tyreke Evans, Carmelo Anthony, Evan Turner, Wesley Johnson and Brandon Jennings among a few of big names featured on the auto checklist!